The fire burned brush on Dahlke Lane, which is near Tualatin-Sherwood Road and Oregon Street on Friday. 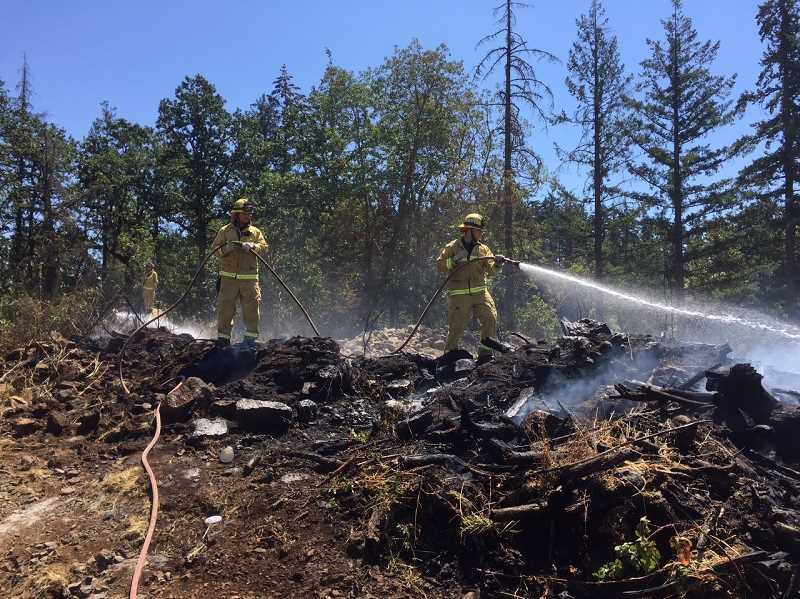 Tualatin Valley Fire & Rescue firefighters knocked down a brush fire on Dahlke Lane (near Tualatin-Sherwood Road and Oregon Street) shortly after noon on Friday. The fire was quickly extinguished before it reached a stand of trees. A man working in the area using a grinding tool said the tool caused a spark that ignited the nearby grass. "With these extreme temperatures, everything – siding on homes, fences, decks, and vegetation – becomes superheated," said Cassandra Ulven, a spokeswoman for Tualatin Valley Fire & Rescue. "When fires start, they spread more rapidly and cause more damage. This is a week in which extreme caution should be exercised to ensure fires don't start in the first place."